Henry Ford, who caused the petroleum era. In 1878 Thomas Edison invented the first electric light bulb. This single invention proved to be so popular that it caused a major recession in the oil industry. Since 1856 kerosene lamps were used in homes and street lamps. Historians state that the introduction of kerosene initiated the oil industry. Sales and production of kerosene trickled to a standstill as electricity and the electric light bulbs caught on quickly. 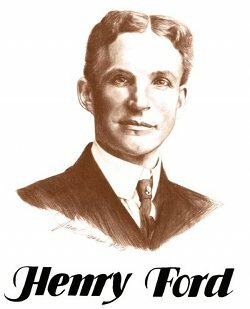 In 1908 Henry Ford's mass produced automobile started a demand for gasoline and initiated an oil boom. Oil Pipelines were built from oilfields in Texas to refineries in the eastern US. With the introduction and public acceptance of mass-produced automobiles the Modern Era of Petroleum began.